This entry was posted in About All and tagged about letters returns on February 9, 2015 . Cable Car’s Q4 2014 Letter has been published. The Cable Car Composite returned +7.2% versus +4.2% for the MSCI ACWI in 2014. This entry was posted in All Ideas and tagged FXCM short positions on February 7, 2015 . Since it appears some daytraders are still anchoring on FXCM’s historical share price in the mid-teens, I put together a quick-and-dirty analysis that recalculates historical prices in terms of the new, post-bailout capital structure. The below trailing twelve-month price chart has been rebased to show the remaining per-share equity value after repayments to convertible bondholders and Leucadia, according to the waterfall schedule in the credit agreement. The difference between the red and blue lines is the point at which FXCM equity holders begin receiving 40% of any remaining enterprise value, which will be a function of the amount of debt repaid through asset sales over the next two months. For simplicity, I used a constant share count of 81.9 million shares including Holdings units, and I assumed that the resulting market cap (price times share count) was equal to the historical enterprise value (net debt assumed zero). This is inexact given changes in excess capital and draws on the previous line of credit, but it is approximately correct. Both assumptions err on the side of increasing enterprise value, to be generous, because the share count increased during the period and net debt (convertible + credit line – excess capital) was negative. 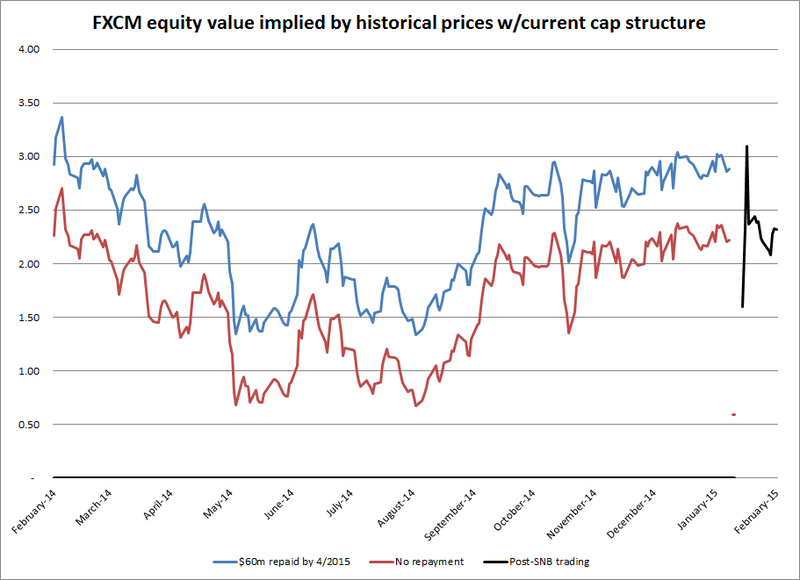 As the chart indicates, the market is currently valuing FXCM equity significantly higher than it did just 6 months ago, and not far from 52-week highs prior to the SNB decision. I’m no daytrader, but using correctly rebalanced historical prices should make FXCM far less appealing from a technical standpoint than anchoring on the $17+ per share prices that were based on an entirely different capital structure. With FXCM equity now having only a residual claim on the operating business, it is as if the pre-SNB share count were diluted by over 80%. The question for investors going forward—and the reason I am short—is whether FXCM deserves the nearly $200 million in market equity value it maintains—in line with or even above its implied post-Leucadia valuation just before the SNB action. No matter how much of the $225 million in negative customer equity is ultimately absorbed by the firm—amounts which should ultimately reduce equity recovery—the entire enterprise value has surely been reduced by the prospect of a fire sale of the institutional business, previously a key growth driver; reputational damage due to the controversial decision to pursue recovery of some negative balances; and loss of trading revenue due to increased margin requirements and the loss of at least 25% of customer equity balances. Should additional customers decide to defect to competitors or trading volumes remain depressed, there is a near-term risk of insolvency. Even if FXCM manages to muddle through, the imposition of $33 million in incremental annual interest costs significantly reduces the company’s ability to implement its strategy and its attendant equity value. As the exceptional costs and ongoing operational fallout of the SNB decision become clear, I expect little to no equity earnings in the medium term, especially if FXCM is forced to sell off profitable business units to meet the Leucadia financing constraints.